All NEW Content Rich Site Design!! Today marks the next phase of my site changeover to WordPress which started back at the beginning of August. I’m proud to present to you a brand new site layout which I think takes this site beyond being “just a Blog”. I have upgraded the site to a WordPress Premium theme in an effort to make it easier to explore the content of the site without having to depend solely on searches and category lists. Browsing the site is pretty self explanatory, but there are a few new features I would like to point out specifically. On the Home page you will always find the “Latest” post at the top. This feature is also reflected on single post pages or category views. Next to the Latest post area is perhaps my favorite new feature of the site which is a scrolling carousel of ALL of the articles in this site containing video content! It is a simple category sort, so If you would rather see the video posts in a larger list, you can simply click on the “SolidWorks Video Tip” link just above the carousel or select that category from the category pull down in the sidebar. Just below the Header area are the top five categories of the site (Excluding SolidWorks Video Tips since it is featured above). The rest of the categories pages can be accessed from the Category pull down in the sidebar. Just below the top five categories is the “Recent Posts” area. There you will find EVERY post from newest to oldest. There is also a REALLY handy page navigation bar at the bottom of the “Recent Posts” area. I have recently taken on webmaster duties for Southern Plate, my wife’s recipe tutorial site. Just after we got her site migrated from Blogger to WordPress, we started looking at some premium themes for both her site and mine. She found this theme and we purchased it with the thought that it could serve both of our sites well. Her site was the first to be implemented since she gets MUCH more traffic than me. After a VERY SMOOTH implementation of the theme to her site last week, it was a no brainer to move forward and get this site migrated ASAP. 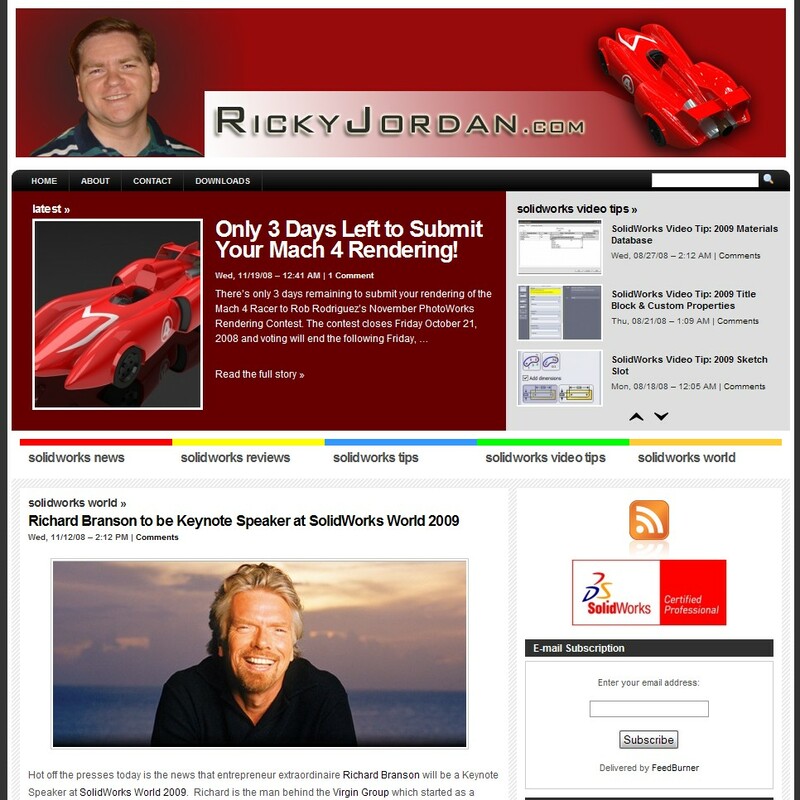 I’d like to hear YOUR thoughts on the new site design so drop me a Comment and let me know what you think. This site is ALWAYS a work in progress and if you think there are additional things I can to do to improve it, let me know. Cool new interface Ricky. I like the sub categories for jumping at the top. The side bar is nicely organized also. Having the latest post at the top may be a little redundant if it appears on the main page also i do like the colors though, a nice crisp contrast. It would be nice if you could bump the font size up a point since I am a lazy surfer and do not use the CTRL+Scroll Wheel to magnify the page usually (should get into the habit). Overall, I will give you a 9.5 out of 10.
sweeet! very slick lookin' + a snazzy remix on the header. very cooler southern brother! What plugin are you using for the twitter feed? Looks great, nice job Ricky. Thanks Josh! I'm glad you like it! I am testing a new Twitter Widget (Will send you the link) which I'm not sure is much better than my old one….but I am using a little trickery to display what you see. The “Twitter Feed” logo is a separate Widget from the actual Widget that goes and gets the Twitter feed. Since this theme will allow Widgets to be spaced closer together than most themes, I was able to make them look like it is all one Widget. Pretty cool eh? For CSS/PHP/HTML rookie like me…I was kinda proud of it. Takes a little to get used to but it sure is nice looking. Keep up the good work. Thanks Steve! I'm glad you like it! It certainly is different. One of the interesting things about this new site layout is that my page views have increased by as much as 50% on some days. The goal was to make the content more accessible which is tough with a “traditional” blog layout. I'm looking forward to catching up with you at SolidWorks World. Maybe we will have some more time to chat this year. Found a site through the WebWorker Daily you may find useful. Free tutorials on just about anything related to the web! I don't see a foobar at all. I checked out the w3school site and it looks really cool! Thanks for the tip. I will have to explore it soon when I get some time.